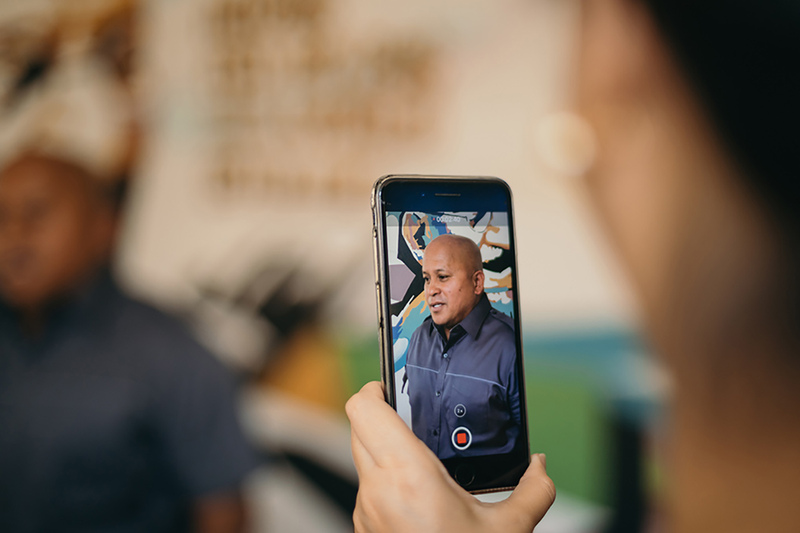 Senatorial candidate Ronald "Bato" dela Rosa made headlines last month when he said he has no more time for debates. Days later, another headline quoted the former chief of police saying people attend political sorties to be entertained and not to listen to issues. He says his knack for unfiltered commentary often gets him into trouble, and we tempt his candor once again, with this interview. 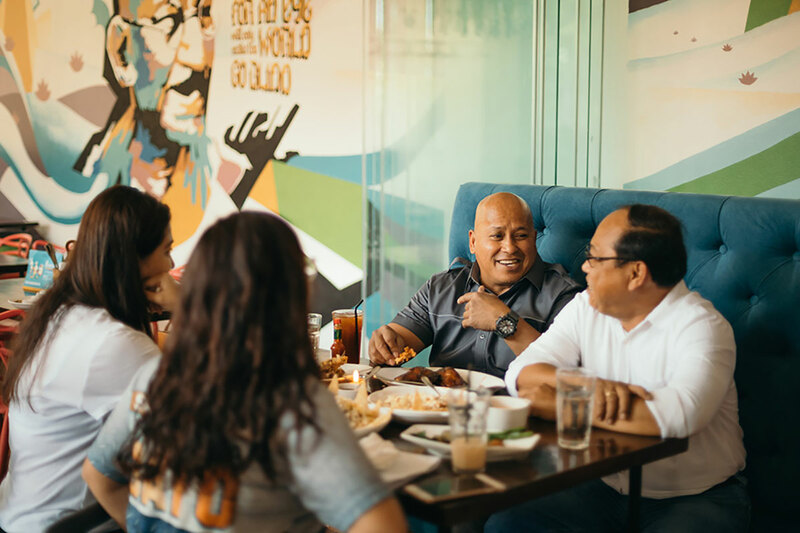 When the general arrived at our interview venue in San Juan—on the campaign trail between Cavite in the morning and Zambales in the afternoon—everybody in the restaurant stood up. There was a palpable change in the place’s atmosphere from when we had arrived two hours earlier. There was something authoritative in his mere presence. 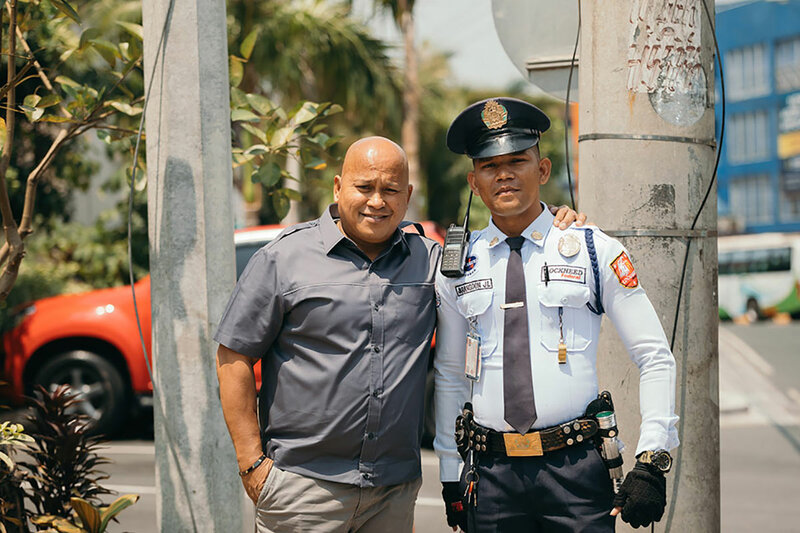 To many Filipinos, Bato dela Rosa is known as the former chief of the Philippine National Police, possibly the most familiar since Senator Ping Lacson, with enough name recognition to take a shot at a Senate seat. 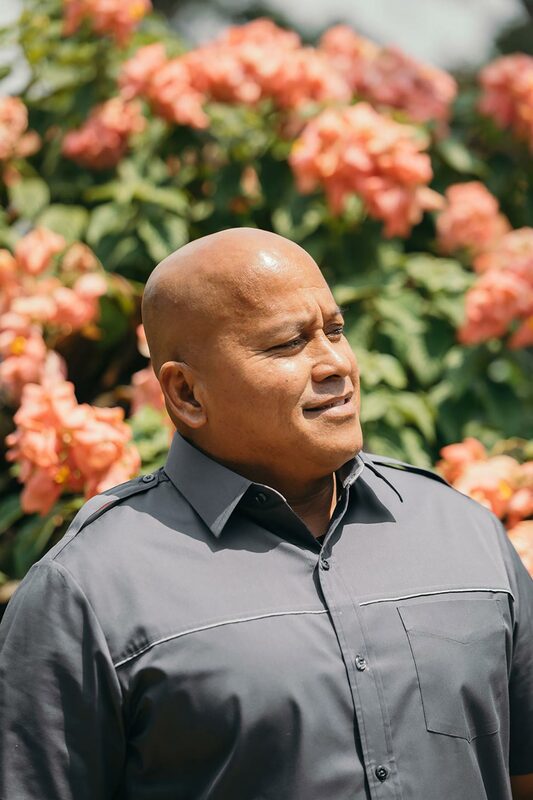 Before he became the country's chief of police, dela Rosa was chief of Davao City's police force, where he first implemented Oplan Tokhang, a campaign against illegal drugs. 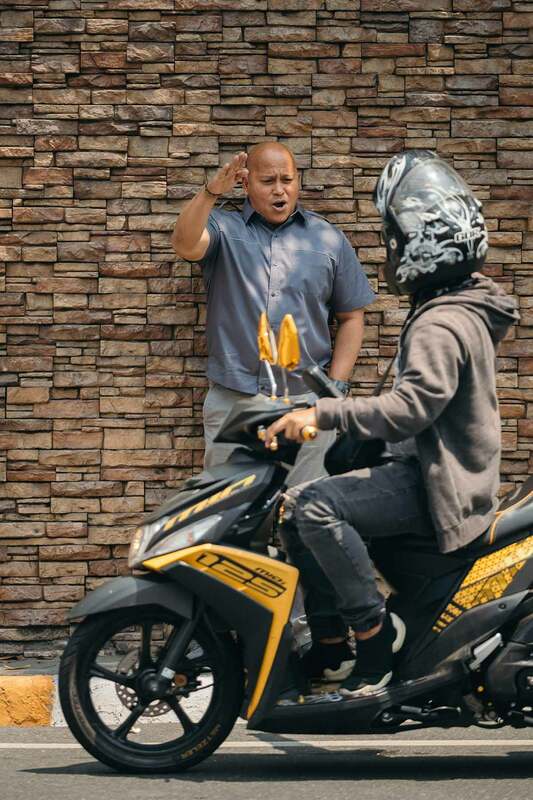 The son of a tricycle driver, dela Rosa grew up poor. As a young kid, he did his classmates' homework in exchange for food. To get to school, he walked eight kilometers from home every day. 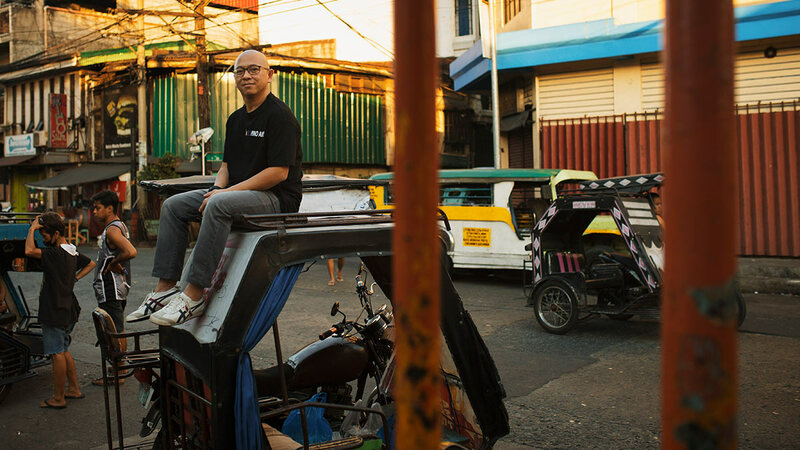 His familiarity with poverty may play a large part in what draws people to him. While we photographed him outside the restaurant, Bato, like a good soldier, obeyed the instructions given by the photographer. The “Chief,” as his aides refer to him, did not have any qualms about crossing a busy intersection or standing in the sun. The shoot took a bit longer than expected because buses pulled over so its passengers could wave at him, truck drivers honked their horns, and motorcycle riders shouted out his name. The general accommodated the security guards and passersby who came over to shake his hand, take his photo, or pose for a selfie with him. 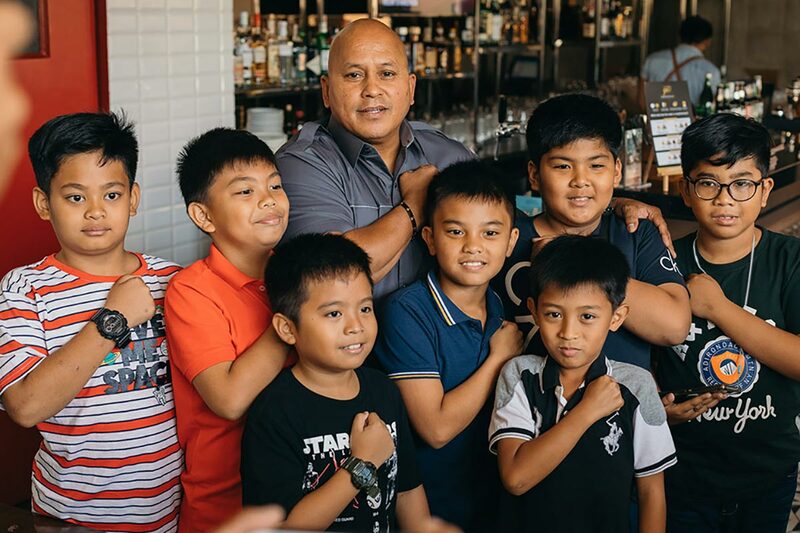 When we re-entered the restaurant, dela Rosa was greeted by requests for more selfies: with a group of children who are part of a football team, with an elderly woman who wished him well, with the kitchen staff who peeked out from their stations. He accommodated everyone despite his tight schedule. Once settled, there seemed to be nothing the could not talk about. 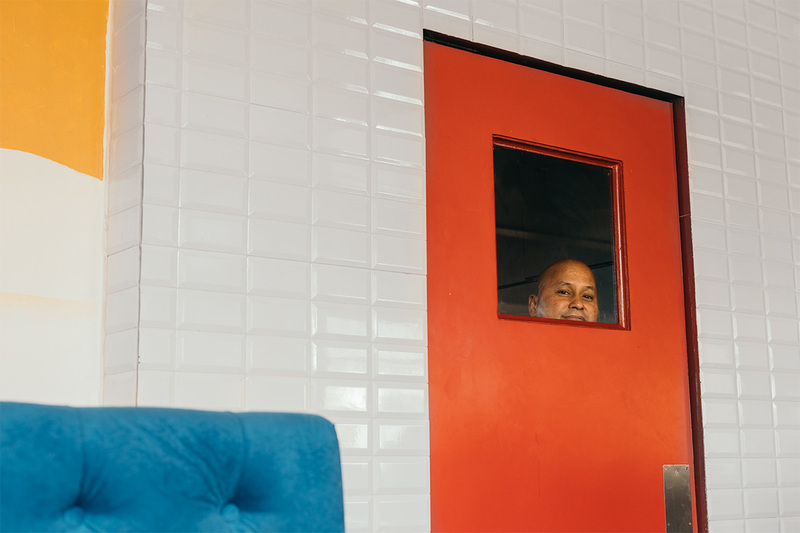 Here, he tells us of the times he was in shoot-outs with enemies, his take on the controversial war on drugs, and his opinion about honesty in government. ESQUIRE: Why are you running for senator? BATO DELA ROSA: Gusto kong suportahan ang ating pangulo. Kailangan niya ng mga alyado sa Senado para mabilis na maisabatas yung kaniyang mga programa. So, I’m here to support the president. And it’s personal for me, nasasayangan din ako sa gains natin sa war on drugs. Gusto kong ipagpatuloy ang ating mga gains from execution [of the law] by supporting it with legislation. ESQ: What laws are you planning to make? BDR: Number one is the restoration of the death penalty for the drug traffickers. Hindi kasama dito yung mga pushers, hindi kasama dito yung mga users, pati mga small-time drug peddlers dahil alam natin na mga biktima lang yan, either biktima ng kahirapan o biktima ng circumstance. Palagi kasing argumento ng mga opositor ng proposal na iyan ay ang magiging kawawa sa death penalty ay iyong mga mahihirap lamang dahil sila lang ang nabibitay at wala silang pambayad sa abogado sa kanilang depensa sa mga kaso. Dahil diyan, hindi natin isasama ang mga small-time [drug pushers, drug users] sa death penalty. Doon tayo sa mga big time. Ito ‘yong mga tao na nagpapabaha ng shabu sa bansa. Ito ‘yong mga tao na nagpapayaman at the expense of our youth. Dapat mahinto na ito. Another reason why I am insisting to reinstate the death penalty, because per my experience with the Bureau of Corrections when I was its director general, kinausap ko ‘yong mga convicted drug lords, convicted drug traffickers na nakakulong ngayon at nagse-serve ng sentence sa Bilibid, at ang rason nila kung bakit nila gusto mag-traffic ng drugs sa Pilipinas is because we don’t have death penalty for drug trafficking here in the Philippines. Added to that, chances are, if they get caught and convicted, and eventually mag-serve sila ng sintensiya sa loob ng Bilibid, kapag mahina ang management ng Bilibid, lalo pang lalaki yung kanilang drug empire sa labas. So imagine, convicted at nakakulong na, patuloy pa rin na gumagawa ng drug trafficking. It has to stop, and the only way to stop this is by death penalty. ESQ: You are talking about catching drug traffickers, the big fish, but some of your detractors are saying that tokhang mainly targeted poor people. What can you say about that? BDR: Well, they should take into consideration the reality on the ground. The reality on the ground is that the organization of the drug syndicate is pyramidal. Pyramidal in the sense that kakaunti lang ang mga drug lord sa itaas, samantalang at the base of the pyramid, nandoon yung mararaming mahihirap na tao na na-involve sa droga. When you wage a war on drugs, you cannot be selective. Otherwise, pag sinabi mong ‘huwag nating gawan ng operation ang isang tao o lugar dahil mahirap lang iyan,’ o kaya, ‘O ito priority natin ito dahil mayayaman,’ that can be considered as selective justice. In the implementation of the law, wala ka dapat pipiliin. Mahirap man o mayaman, uniform ang pagpapatupad ng batas—kaya nga maraming tinamaan na mga mahihirap dahil mas maraming mahihirap na sangkot sa drug trade. Maraming nagtutulak na mga mahihirap, kaya ito ang mga palaging nahuhuli sa buy bust operations. ‘Yong mga Chinese traffickers, marami na tayong nahuli. Paano yung napatay natin na drug chemists doon sa Valenzuela? Paano yung nahuli nating nagmamay-ari ng floating shabu laboratory doon sa Olongapo? Those are big-time drug traffickers. "Walang kinabukasan ang Pilipinas kung nandiyan palagi yung korapsyong ginagawa ng ating mga opisyal sa gobyerno, kaya dapat matugunan ito sa pamamagitan ng death penalty para matakot talaga sila magnakaw ng pera ng bayan." ESQ: Since you came into office as PNP chief, you have always supported Duterte and been consistent in saying that the number one problem in the Philippines is drugs. Can you identify three other big problems in the Philippines and why you consider them as such? BDR: Criminality is one, and this is highly connected with the drug problem. Another one is corruption and another one is terrorism. We believe that peace and order is paramount in achieving economic development. It’s the number one requirement. You cannot have development without peace and order. ESQ: As senator, how to you plan to address these three things? BDR: Number one, sa drugs, ibalik yung death penalty. That is part of the supply reduction strategy. For the demand reduction strategy, dapat magkaroon tayo ng batas na magsasabi sa DepEd na isama sa curriculum ‘yong drug awareness and resistance education, mula sa pinakamababang grade level hanggang mag-graduate sa college. Dapat nandiyan lagi sa curriculum iyan to instill in the minds of the youth the ill effects of drug abuse para matakot talaga sila gumamit ng droga. Dapat nandoon iyan sa educational system natin, sa curriculum. Ito naman sa criminality, as I have said, when we hit the drug problem, we also hit the criminality. Pag mataas ang drug problem, mataas din ang criminality. Pag mababa ang drug problem, ganoon din sa criminality. We have proven this during the early days of the Duterte administration when we hit hard on the drug problem. Noong nag-surrender ‘yong 1.3 million, noong nahuli ‘yong 130,000 na hanggang ngayon nakakulong pa, it resulted in the decline in the index crime volume by 49 percent—napakalaki ng ibinaba, so malaki yung correlation ng dalawa. For corruption, believe it or not, once makalusot itong death penalty for drug traffickers, the next target is death penalty for corrupt politicians and government officials. We should once and for all address this issue. Walang kinabukasan ang Pilipinas kung nandiyan palagi yung korapsyong ginagawa ng ating mga opisyal sa gobyerno, kaya dapat matugunan ito sa pamamagitan ng death penalty para matakot talaga sila magnakaw ng pera ng bayan. I can see how this will be a very lonely battle because I don’t think I will win much support from other legislators when it comes to legislating death penalty for corrupt politicians. I hope darating yung punto na makonsensya na sila for the sake of the fututre Filipino generation. Sana makatikim na sila ng Pilipinas na walang corruption. "Honesty is the best policy. No more, no less. You have to be honest... regardless if the truth hurts, if it is the truth, you can never go wrong. You stay with the truth." ESQ: Earlier, you mentioned that you are running for senator because you want to support President Duterte. Tell us about your relationship with the President. BDR: Our relationship dates back to 1986—that was 33 years ago. From then on, naging ninong ko siya sa kasal, at saka parati siyang nagmo-monitor sa aking mga accomplishments. From 1986 to 1989, insurgency in Davao City was so bad. Literally almost the whole city was being penetrated and held by the Sparrow Units of the NPA. Every day, we had encounters with the New People's Army, and back then, Mayor Duterte monitored all our operations. Doon nagsimula ang aming relationship. We share the same dreams and aspirations, we share the same beliefs, we share the same passion. Kaya nag-click ang aming samahan. ESQ: Your partymates, particularly Mayor Sara, mentioned that honesty is not an issue in this election. Do you agree? BDR: In fairness to Mayor Inday Sara, she was able to say that out of frustration siguro na, ‘puro kayo kwan, pareho naman kayong mga sinungaling na mga pulitiko,’ parang ganoon sinasabi niya. Ginagamit ng oposisyon, ng kabila, yung issue about yung Imee Marcos, di ba? Inday Sara, being the chair of Hugpong ng Pagbabago, humanap lang siya ng paraan na madepensahan yung miyembro ng kaniyang team. Pero sa akin naman talaga, honesty is the best policy. No more, no less. You have to be honest, you have to be honest. I’m known by the people to be an honest officer, a transparent individual, sometimes to the point that yung aking honesty sometimes leads to troubles because nasasabi ko yung mga dapat hindi ko sabihin at the expense of my organization, at the expense of myself. Pero sabi ko nga, at the end of the day, regardless if the truth hurts, if it is the truth, you can never go wrong. You stay with the truth. Iyon ang aking policy. Importante iyon, otherwise, if we don’t value honesty, what will become of the Philippines? It will become a nation of liars? Sinungaling tayong lahat? It’s not good. ESQ: What are the three most important things to you? BDR: Number one, love of God. If you love God, then you will be guided in your actions, regardless of whether you are being pushed to the wall, you will find no other recourse for survival. If you believe in God, something good will happen to you. Number two is love of country. Marami tayong Pilipino ngayon na nagkukulang dito, yung pagmamahal sa ating bansa. If you love our country, that means you must be patriotic. You must be nationalisitc. Mahalin mo iyong bansa mo. Number three is love of your fellow men. Kailangan marunong kang maki-kapwa. Mahalin mo iyong kapwa mo lalong lalo na 'yong mga marginalized. Ako kasi, I am known to be a "pusong bato" when it comes to criminals, pero ako’y "pusong mamon" pagdating sa mga inaapi. My heart bleeds for the these people. Ayaw na ayaw ko na may inaapi, kaya you should love your fellow men. "Ilang beses ako nakipagbarilan sa mga hostage takers, ilang beses akong nakipag-giyera sa mga NPA. I’ve been through a lot of armed encounters with the enemy, but I don't consider them as my greatest accomplishments." ESQ: Incidentally, we were talking about this earlier. 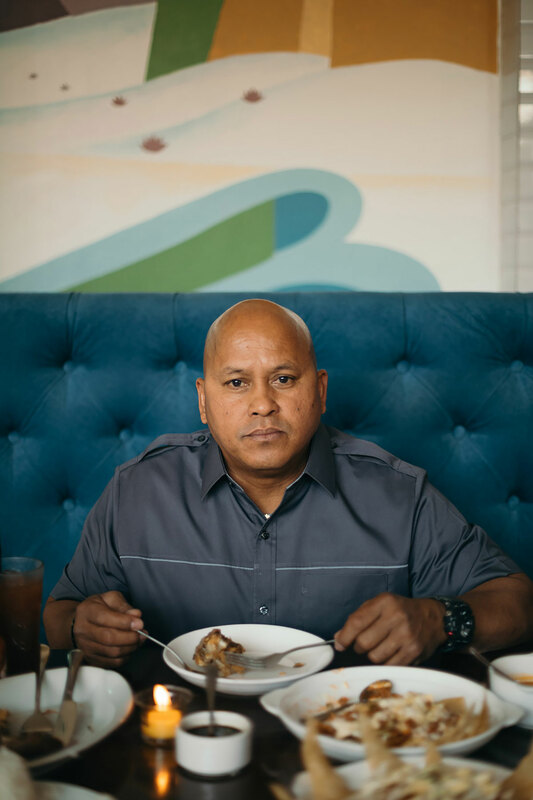 Why are you called “Bato”? BDR: (Laughs) Well, literally and figuratively, dahil nga ‘yong aking katawan pagka-graduate ko sa PMA (Philippine Military Academy) ay talagang physically solid dahil sa training namin sa SROC (Scout Ranger Orientation Course) sa Tanay, Rizal. Pagka-graduate ko sa SROC at pagdating ko sa first assignment ko sa Davao City sa Camp Catitipan, nakita ako ng mga senior officials doon. 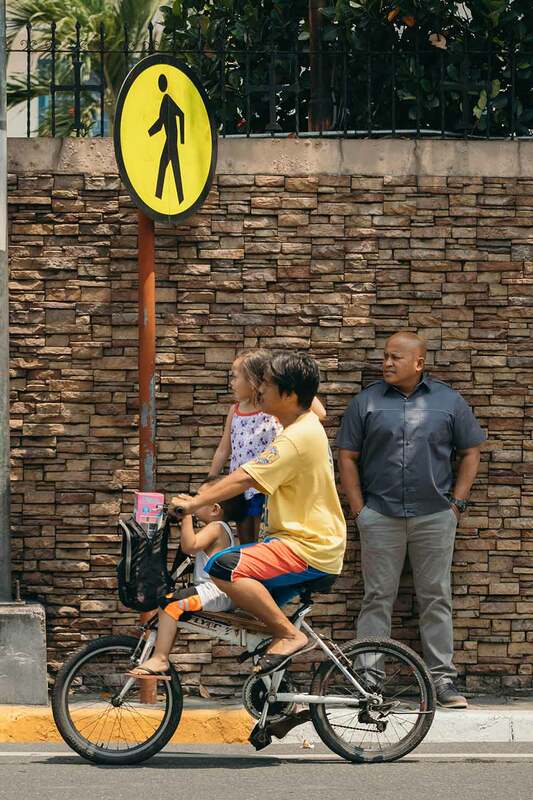 Ang tawag nila sa akin “Bato” noong nakita nila ‘yong katawan ko na batong bato. ESQ: Apart from becoming PNP chief, do you have any achievement that you consider your biggest so far? For example, perhaps you busted a big time crime syndicate? BDR: Ay, marami, marami na-busted na sindikato. Before I was the PNP Chief, marami akong na-rescue na mga kidnap for ransom victims. Ilang beses ako nakipagbarilan sa mga hostage takers, ilang beses akong nakipag-giyera sa mga NPA. I’ve been through a lot of armed encounters with the enemy, but I don’t consider them as the greatest accomplishments. Ang kino-consider ko lang na greatest accomplishment in my life and in my career is iyong I was able to bring back the PNP closer to the people. Naramdaman ko noong ako ay naging chief ng PNP, at hanggang ngayon, bumalik yung tiwala ng mga tao sa kanilang kapulisan. Humahanga ang mga tao dahil sa mga ginagawa ng kanilang mga pulis. Hindi ko madi-discount yung mga ginagawa ng mga scalawag. May mga scalawag pa rin na humihila pababa sa tiwala ng mga taumbayan sa ating kapulisan, pero nananatili pa rin 'yong paglapit ng kapulisan sa mga taumbayan. ESQ: Do you have anything you want to say to the people or to your detractors? BDR: To my detractors: God bless you! (Laughs). I hope that you become enlightened and stop yourself from being blinded by our political color. Kahit anong ginagawa ng ating gobyerno o ng Duterte administration na pangkabutihan, dahil nga lang kalaban niyo sa pulitika, ayaw ninyo na may magawang maganda iyong ating gobyerno. Ino-oppose niyo nang ino-oppose lahat kahit na pawang kagandahan at kabutihan ang ginagawa ng ating gobyerno. Sana matanggal na yung pamumulitika. Suportahan na lang nila ang ginagawa ng ating gobyerno. Lahat naman tayo nakikinabang dito, eh.